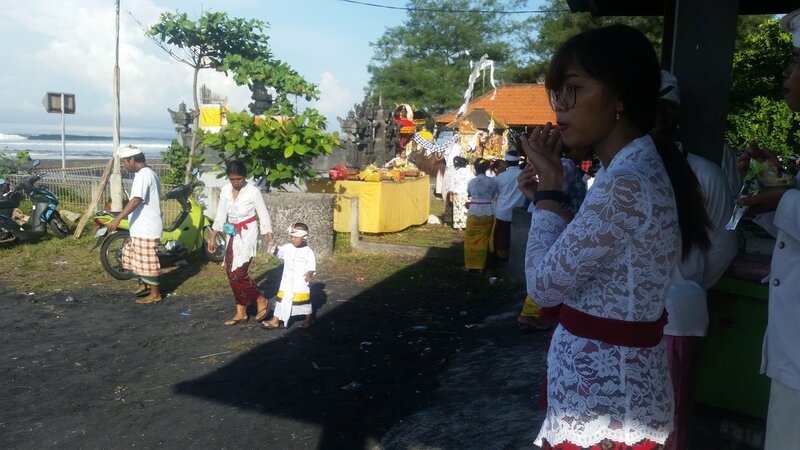 Within hours of arriving in Bali, I was told about Nyepi, a Hindu New Year festival that the Balinese celebrate every year in March. This year, Nyepi was to be held on March 7th, two weeks after I arrived. 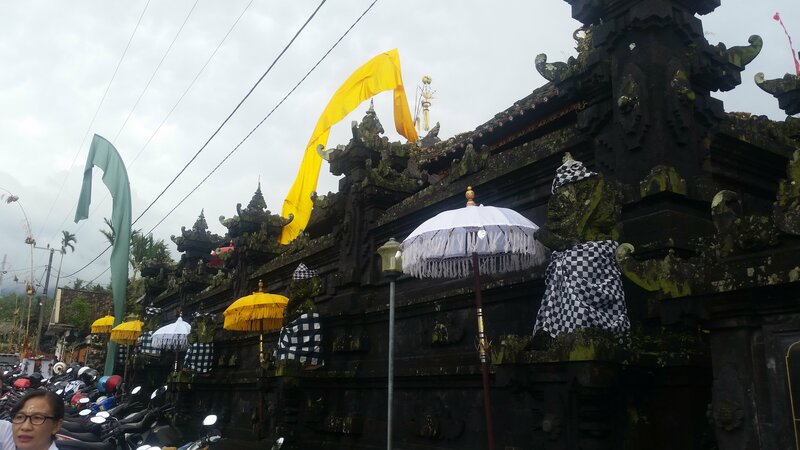 It’s a festival celebrated exclusively in Bali, so supposedly there is a lot of unique culture that you won’t find elsewhere. 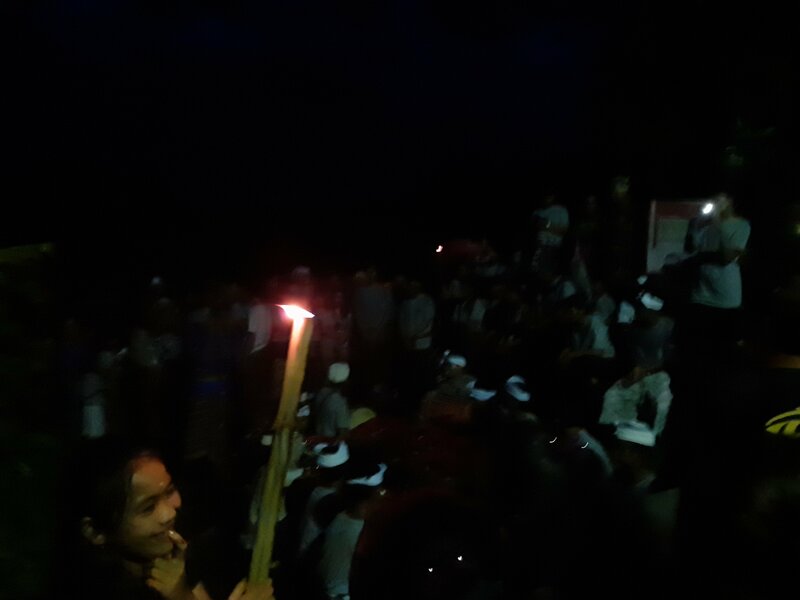 Nyepi itself is intended to be ‘a day of silence’; nobody is allowed to go outside for 24 hours, create light, start fires, or make excessive noise. That doesn’t sound particularly exciting, but the few days beforehand have lots of parades, culture, and activities. If Nyepi is called a silent day, then the days before it should be called noisy days! I’ve been told that some foreigners fly to Bali specifically to see the Nyepi celebrations! For me, I just chanced into it by being in Bali at the right time. 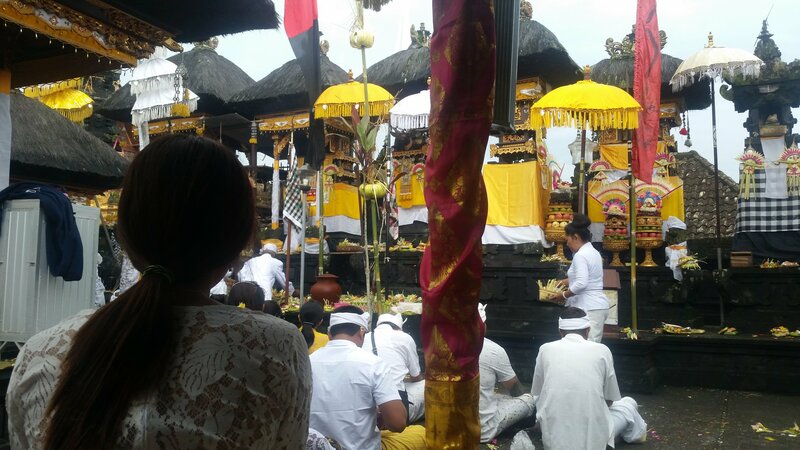 I ended up celebrating Nyepi in a local Balinese village without another foreigner in sight. 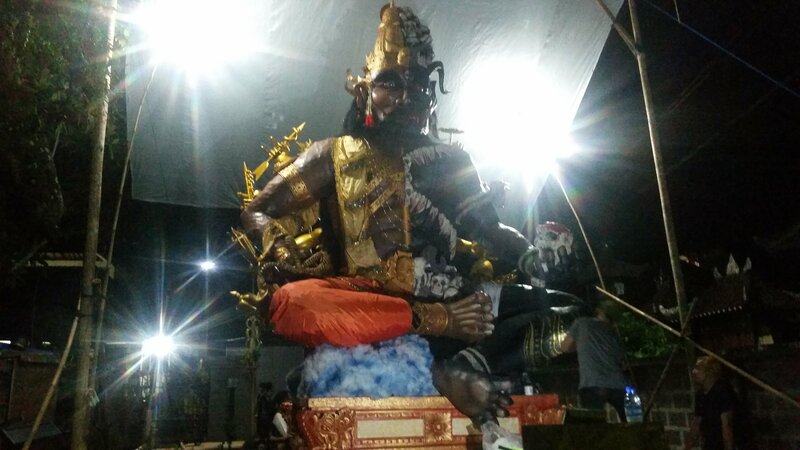 There was a lot of excited chatter about Nyepi in Bali. Advertisements dotted the streets of Canggu offering ‘authentic’ ways to enjoy Nyepi ‘like a local’, meanwhile the locals enthusiastically told me about how they were looking forward to spending time with just their families. As soon as I arrived at my apartment, the staff made sure I knew about the dates of Nyepi and warned me that I wouldn’t be allowed to enter or leave, and advised that I should make any necessary preparations in the days before. 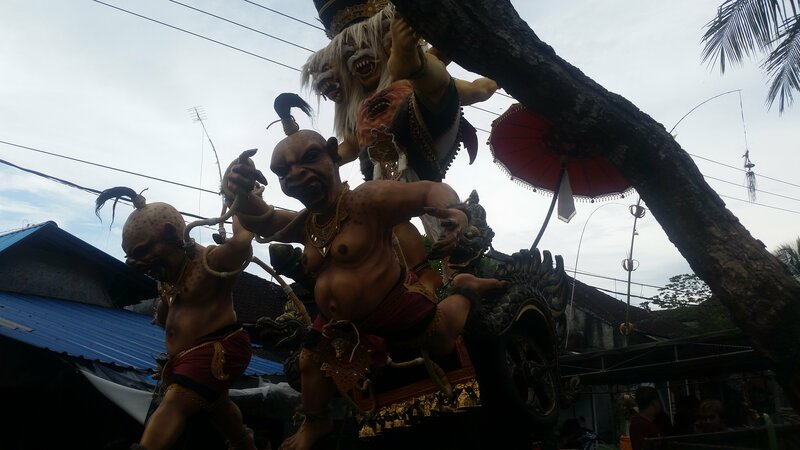 My impression was that the Balinese take Nyepi extremely seriously, especially in heavily populated areas. Everyone must turn off their electricity; lights, devices, etc. I was told that you aren’t meant to light fires or candles either. Nobody is allowed on the roads, enforced by a local ‘security force’ (allegedly this is basically the local mafia) called the Pecalang. As a tourist first hearing about it, it sounded like a drag and an inconvenience. 24 hours alone in my room without WiFi, and I’d have to make sure I had enough food and water in advance, and… blah! Soon after arriving in Canggu, things changed. 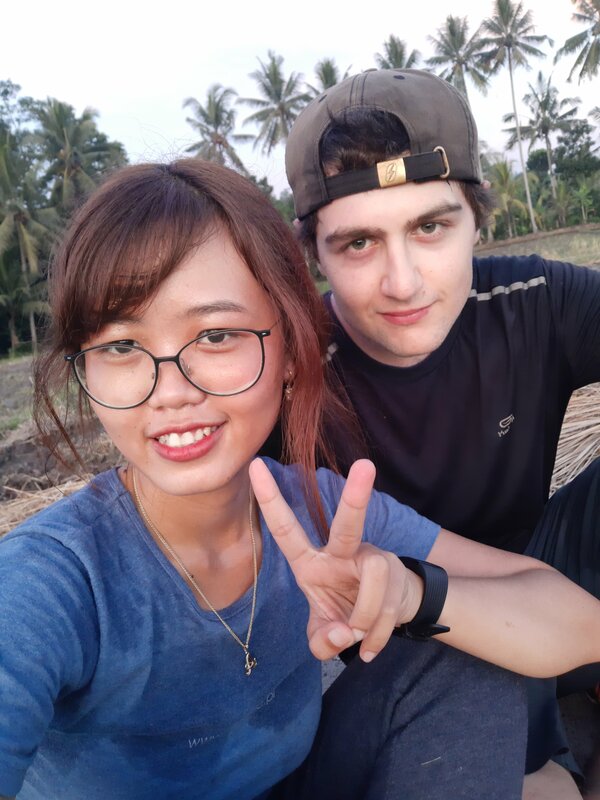 I had met Ni, a local Balinese girl, and we quickly entered a relationship together. She invited me to stay with her and her family for Nyepi in her father’s home in her remote village, Dalang. She told me that she would take me to the pre-Nyepi rituals and celebrations with her villagers, too. Suddenly, the festival sounded incredibly exciting! A few days before Nyepi, the Balinese celebrate Melasti, a traditional ceremony held at the beach. Every village has a schedule that they follow so that they all get time at the beach. I found out later that Melasti is about praying to a spirit called Sang Hyang Baruna to bring happiness to the world, but at the time I had no idea what we were doing or why we were there. The ceremony is held at the beach so that the villagers can use the water to ‘clean’ themselves. They are Hindu so believe that an aspect of their god exists is in the ocean. They hope that by cleaning themselves with the ocean water, their god will purify and recharge both them and the world. One day, Ni asked me ‘Do you want to visit my village tomorrow?’. Of course I did, as I hadn’t been there before. She hadn’t mentioned anything about Melasti to me, nor did I know anything about it independently of her, so when she handed me traditional Balinese clothes the next morning, telling me to shut up and get dressed, I was surprised and intrigued but obliged anyway. 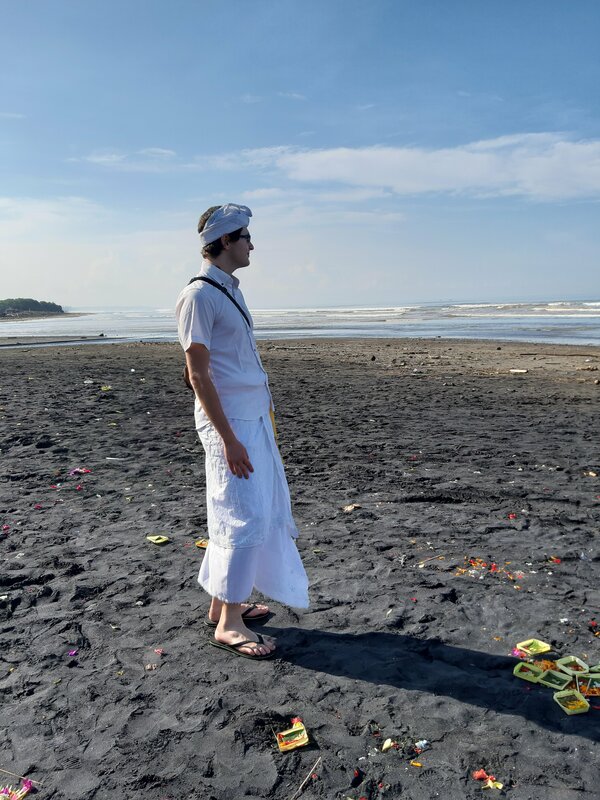 Wearing traditional Balinese clothing on a black basalt sand beach. Canang Sari litter the floor. Ni and her villagers all drove to a fairly secluded beach to complete the ceremony. Ni’s village, Dalang, is fairly small, so she knew everybody attending. We were some of the last to arrive, so all the villagers kept asking her about me. I stood out - I was the only bule (foreigner) present. From what I could tell, the villagers had never had a bule come to celebrate with them before. They were interested and intrigued by me, but welcomed me all the same. It probably looked very strange to them to see a foreigner wearing their traditional prayer clothes. It felt very special to be taking part in the festival with the local Balinese in a way which hadn’t been commercialised to hell and back. I liked that there were no other western onlookers, just the villagers peacefully continuing as they had for decades or centuries, and how they will continue to do so in years to come. It gave me the comfort that their actions were authentic; they weren’t doing it for the benefit of the western man. This procession would have continued identically whether I was there or not. Standing at the shrine for Melasti. At one point, Ni briefly left to leave an offering and to burn incense, so I stood alone with her father and other relatives. She eventually returned and introduced me to more of the villagers. One man worked on cruise ships, so he knew Southampton - the city where I went to University - as it is a central transport hub for cruise ships for the United Kingdom. Eventually, the mingling stopped and everyone sat down to begin prayer, and I was asked to join them. I didn’t know what to do so I kept one eye open and copied Ni. I always have to do similar when I am with my Christian relatives during prayer; I have to mimic them, too! We sat opposite a representation of the spirit Sang Hyang Baruna (which looks like an angry dragon), as well as a small ‘house-like thing’ that Ni tells me is called a Pratima (so I assume somewhere inside is a sculpture of the Hindu god). We sat facing the Spirit and the Pratima. 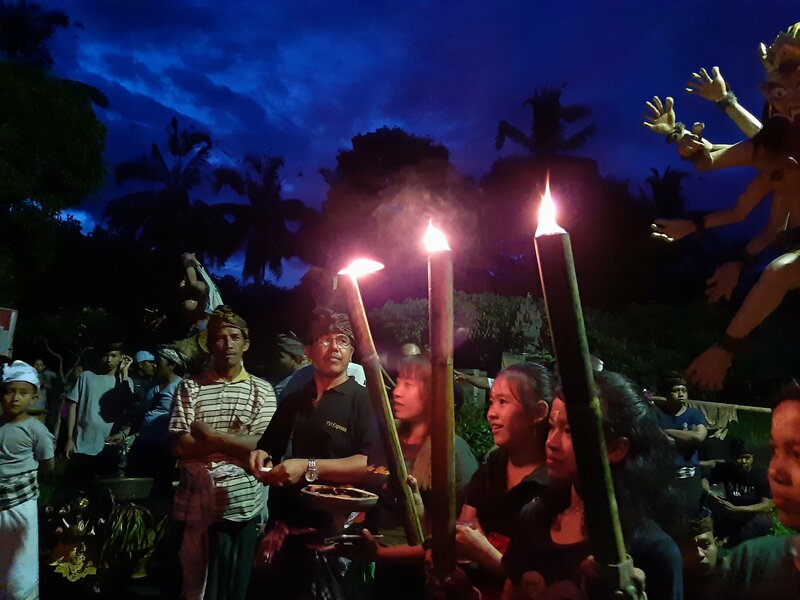 The villagers all sat cross-legged and lit the incense in their nearby Canang Sari. (Canang Sari are daily offerings of petals and foliage inside a banana leaf basket, you see them all over Bali). The incense created a pleasant atmosphere and everything began to feel very calm. I closed my eyes briefly and I could hear the waves in the distance. Somewhere behind me and to both the left and right, some of the villagers were ringing small bells, the long notes hanging in the air. Somebody said something in a very deep voice, and I could tell that everyone was doing something so I opened my eyes. Everyone has taken a few petals from their Canang, and are holding the petals between their fingers and raising their hands above their head in prayer. I copy. After some time, the deep voice says something else, and everyone lowers their hands and drops the petal (or sometimes put it behind their ear? I got confused!). Again, I copy silently. The process is repeated a few times before moving on, and I feel relaxed, but I couldn’t fully get into it as I was anxious to be alert to make sure I was doing the right thing. We continue to sit. Ants were swarming in the grass and kept crawling onto my legs. I did my best to remain still but some of the ants were biting me. We continue to sit. The elders pass by each villager and splash holy water on them using a little brush. The elders offering each villager more holy water, splash some into the hands of the villager four times; for the first three times, you’re meant to drink the holy water from your cupped hands, whilst on the fourth time, you should push the holy water back on to you head and into your hair. I didn’t fully notice this subtlety and mistakenly drank it for the fourth time too; there was a little bit of annoyed shouting but they forgave me. Next, the elders offer a small dish containing uncooked rice; you take some, eat three grains, and then press the rest into your forehead and into the base of your neck; it’s slightly wet and quite starchy so sticks to your skin. Eventually, everybody stands up, and they start playing Gamelan. Gamelan is a traditional ensemble music; you hear it in the distance from time to time in Bali. There are lots of types of instruments, and the specific set of instruments varies from ensemble to ensemble. The villagers from Dalang had a pair of big gongs, a set of steel drums, a group of small hand cymbals, and lots of small bells. I actually first encountered Gamelan whilst playing Hotline Miami 2, though I didn’t know it at the time. A song titled ‘Java’ features as the background music for the intro to the level called Ambush; it was only when I heard Gamelan in Bali and asked what the music was that I was able to make the identification. After the Gamelan started, everybody began walking to the shore. The beach was made of a black basalt sand which was reflective and shiny. The village elders went first, followed by others carrying the Spirit and the Pratima. The Gamelan players came last; presumably because the gongs are heavy and because playing requires some concentration. After reaching the water, the villagers stop and scoop up water with their hands and throw it over themselves a few times. I assume that this is implicitly asking their god to clean them. Either way, it was funny to me seeing the villagers in their pristine white clothing splashing black sandy water onto themselves to make themselves ‘clean’. We left the beach covered in black grimy sand, with beads of rice stuck to our faces and necks. It felt peaceful and magical but I wanted to shower. Ni retrieved the offering that she had left earlier. Offerings in Bali are quite weird to me; they make all sorts of offerings all the time, but then sometimes they ‘take them back’. I get the impression that whilst the incense is burning, they offering goes to their god, but that afterwards you can take back what was given and do what you want with it. This offering in particular was a colourful, covered woven basket full of food. The villagers loaded up the Pratima and the Spirit on to a few big trucks and began to make the 20km trip back to the village. Some villagers stood on the trucks too, whilst others followed on their scooters. Ni and I took a detour to get drinks and snacks, and to take a bathroom break. 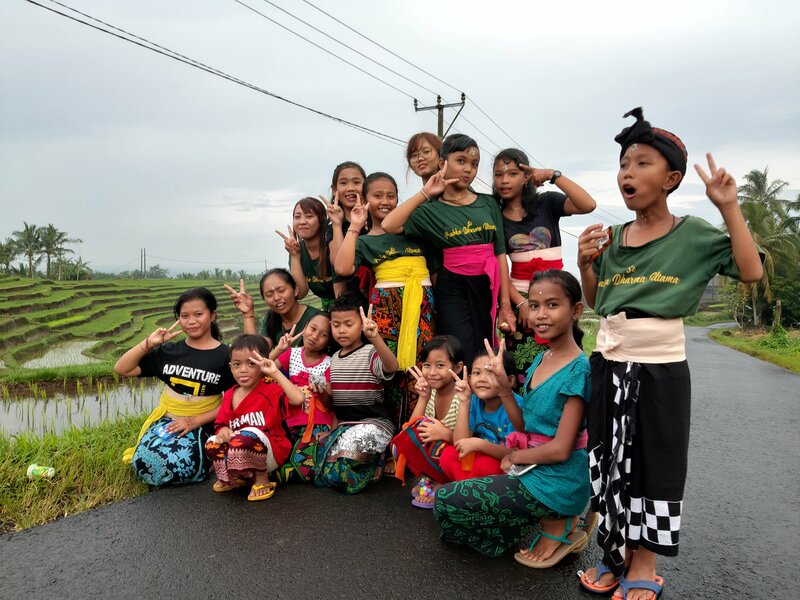 During our journey to the village, a big lizard ran onto the road, and all of the Balinese started yelling and beeping the horns of their bikes to scare it away. 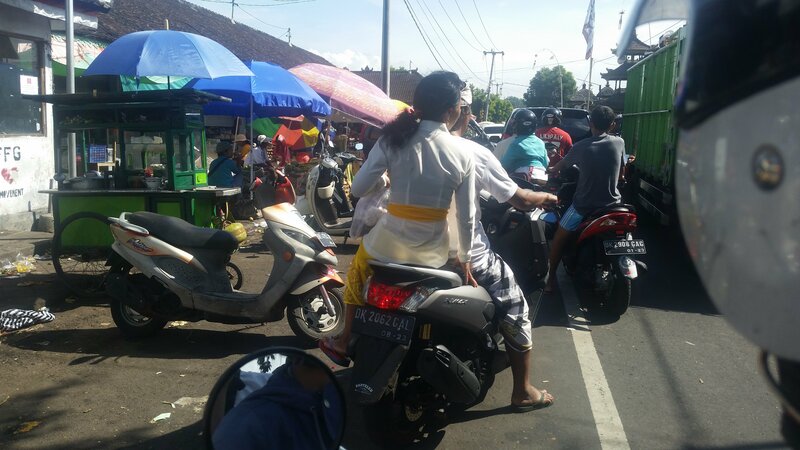 Villagers in traditional Balinese clothing riding their motorbikes. On the way the Dalang, we saw other villages going to the beach. You hear the Gamelan before you see anything; then you see the trucks and the villagers dressed in white. Each time I watched as they passed by. When we eventually got to the village, we found that we had managed to catch the procession; they had only just arrived because they drive slowly. Entrance to Ni’s house in Dalang, from the inside. Ni’s house in the village is really cool. It’s not really a ‘house’ as the west would consider it, but rather a series of single-room buildings placed around a central courtyard. 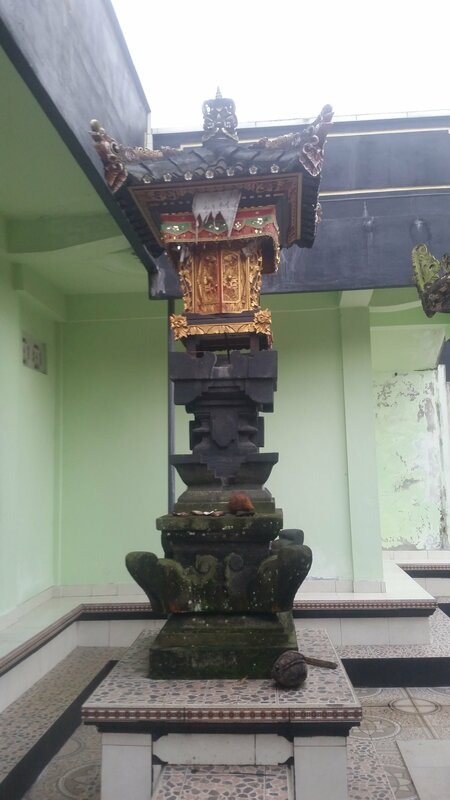 There is an ornately-decorated structure called a Lumbung in the middle of the courtyard that essentially serves as the central gathering point of the home. 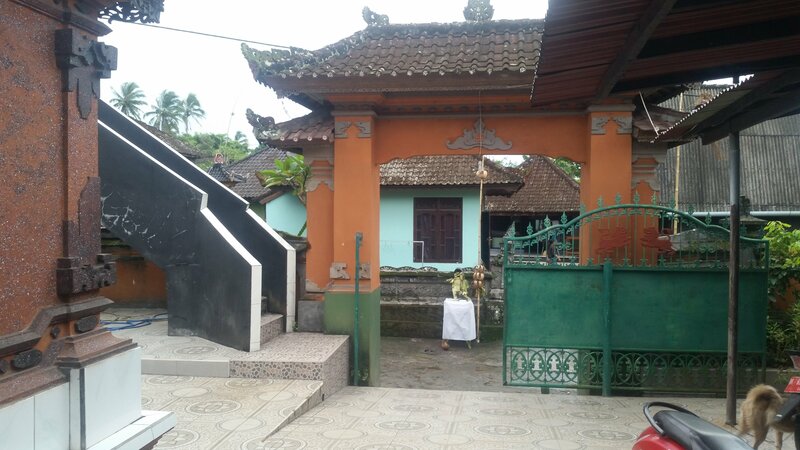 The Lumbung (left) is the central point of a traditional Balinese home. A Lumbung is made of two parts; a raised platform used for resting, eating, and working, and a ‘attic-like’ space used to store rice and other foods. A small shrine between two buildings. The buildings in the house in Dalang all look like miniature temples to me, and it felt quite magical to be there. 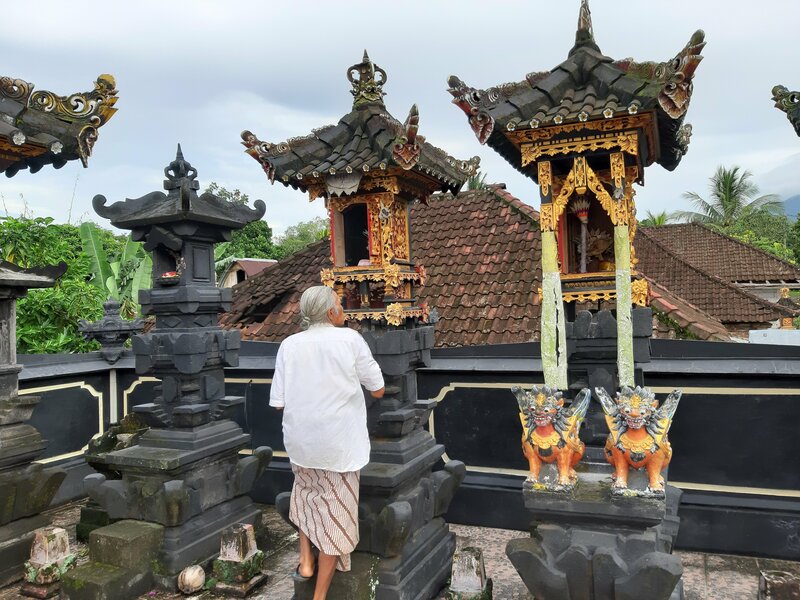 Every Balinese house has an actual miniature temple too, and this one was no different. There were even more temple-statues on the roof, too. There are swastickas in a few places, but I wasn’t surprised as I knew that they were an ancient religious icon in Asia before they were a symbol of hate in the West. Shrines on the roof of Ni’s house in Dalang. 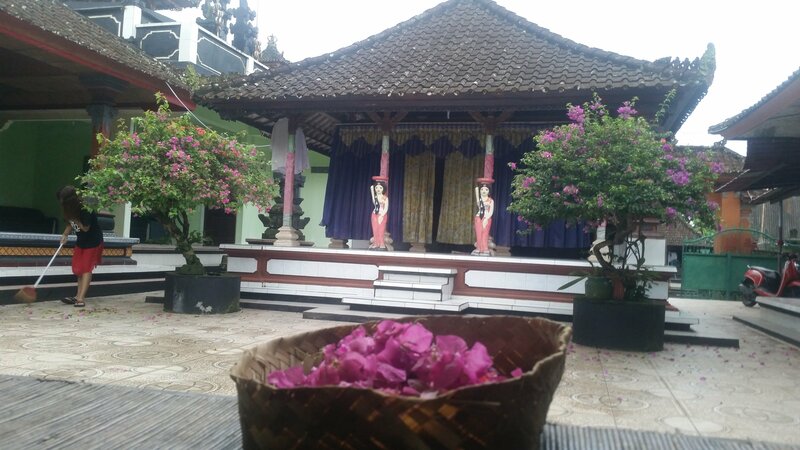 The courtyard between the buildings had two small flowering trees, which the family pick for offerings to make the Canang Sari with. Flowering trees and a basket full of petals. Ni’s father’s house in Dalang reminded me of an oriental-themed 3D-modelling challenge that my friend Zocky participated in back in 2014. 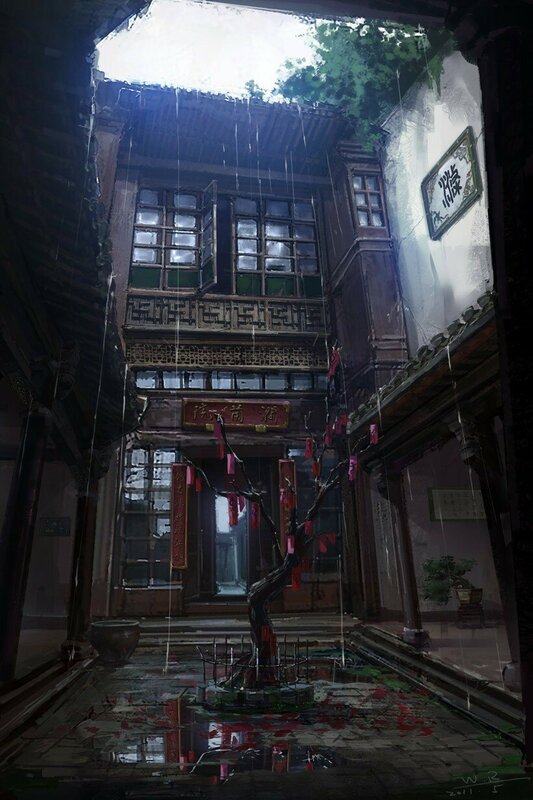 The challenge had been to create a 3D model of a piece of concept art of a beautiful oriental courtyard. Back in 2014, I kept thinking about how much I’d love to live or visit somewhere like that. Visiting Ni’s house in Dalang is the closest actualisation of that desire that I’ve had in my life so far. Concept image by Wang Rui. They also keep animals in the house in Dalang. They have pet dogs; two that belong to Ni’s father that live in Middle of Dalang permanently, and two more that Ni’s mother brought from Tabanan to stay with us for Nyepi. They keep pigs in a pen - two adults and many piglets - but I really don’t like the living conditions that they have; I think the space is too small and unclean. 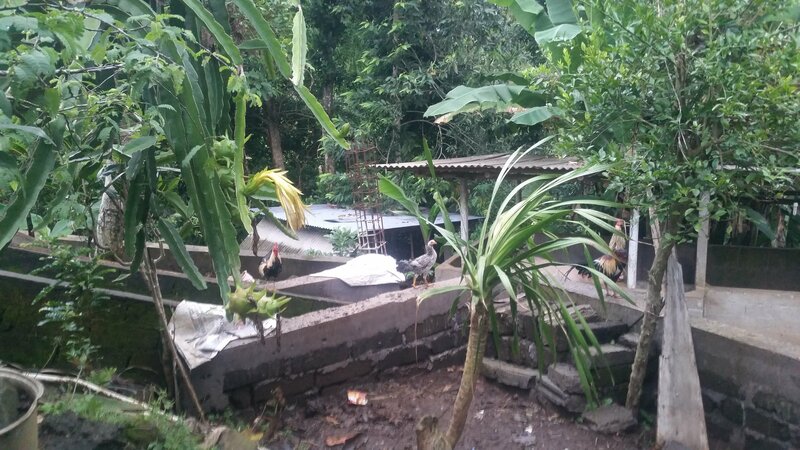 They also have free-roaming chickens, a couple of which that are roosters. They roam freely with no barriers, to the point that Ni’s father told me that sometimes the roosters get attacked by big lizards. I was reminded of the Water Monitor I saw in Bangkok. Ni’s father only raised the animals to sell; he don’t kill or eat them himself as he is a vegetarian. The animal pens in Dalang. Pigs live in the space under the corrugated metal roofs. We sat on the Lumbung and ate the contents of the offering box that Ni had left at the beach - Pastel (one of my favourite Indonesian foods - pastry filled with glass noodles), Tempe Chips, grapes, oranges, longan (my first time trying it), as well as a variety of other cakes and things that I don’t know the name of. The next day, whilst staying in my room in Canggu, I’d occasionally hear the (now familiar) sound of Gamelan approaching, signifying that a village was passing through to celebrate Melasti as the Batu Bolong beach. I didn’t go to the beach to see any of those ceremonies as I felt that my time with the villagers from Dalang had been special enough. The day before Nyepi is called Ngrupuk (or perhaps Pengerupukan - the spelling and word used varies! ), and - in my opinion - was the best part of the Nyepi celebrations. The exterior of Pura Kawitan Kubayan. On the morning of Ngrupuk, we visited the Pura Kawitan Kubayan temple for prayer. Apparently it was the ‘Odalan’ for the temple, which (I think?) is a celebration of the anniversary of the temple’s founding. Kind of like a birthday, except not quite, as the Gregorian Calendar date changes as they follow the 210 day Balinese calendar. I didn’t know any of this at the time - the Balinese love to delay doing anything, including dispensing information. The most common response I get when I ask Ni a question is “I’ll tell you later”; it’s infuriating! When I asked what we were doing on the day, I didn’t get a satisfactory answer, so I had to ask about why we went there after the fact. At the time, in my mind, I was just visiting a temple and didn’t know why. The gate to the prayer zone inside the temple. The prayer at Pura Kawitan Kubayan was nearly identical to the prayer at the Melasti ceremony - including the bell ringing, the incense, praying with petals from a Canang, and the holy water. We repeated the process in two different parts of the temple. The second time around, Ni pointed to somebody and told me that he was possessed, and that we were praying to help him. Uhhh, okay then. Eventually we left the temple to go to Dalang again. 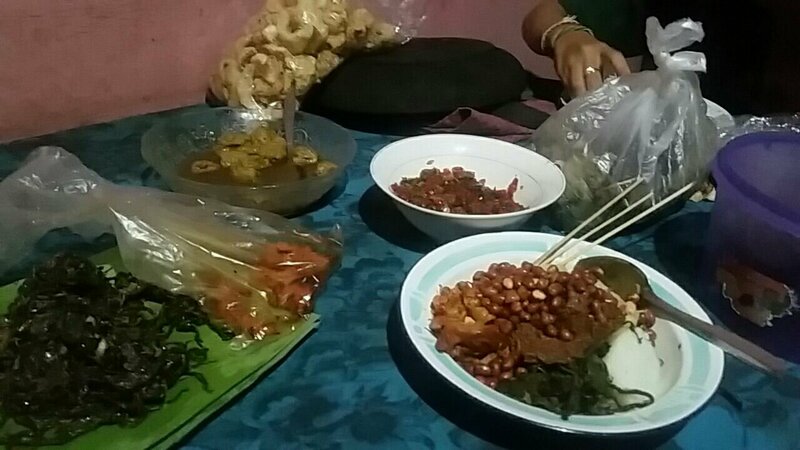 We stopped in briefly at Ni’s house in Tabanan to fill up a car with lots and lots of pre-prepared food that we would eat during Nyepi - we needed to stock up as we wouldn’t be allowed to cook or buy more for obvious reasons. 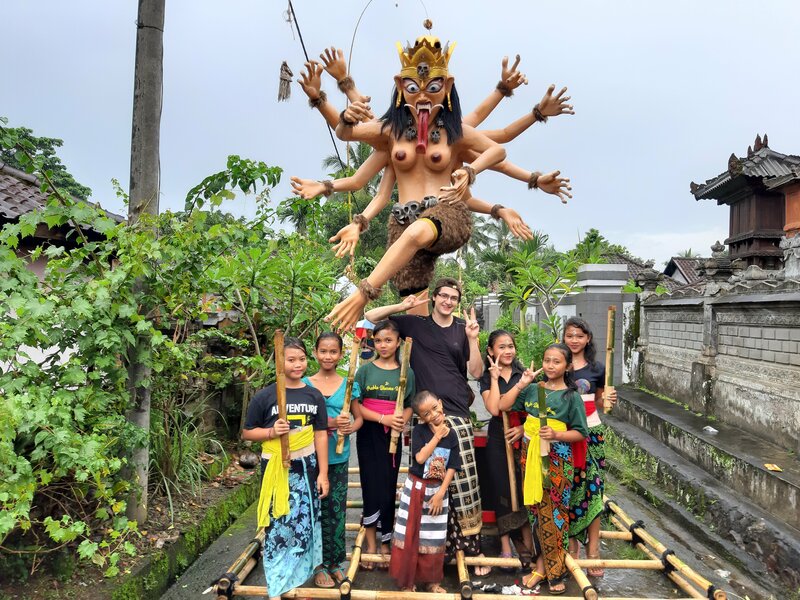 After a few times of her saying the same thing, I looked this up and found out that an ‘Ogoh Ogoh’ is a statue built for the day before Nyepi. The Balinese are master craftsmen and these Ogoh-ogoh are amazingly detailed. Every village makes one; I’m not sure how it works for bigger towns, but I know that I saw several whilst I passed through Tabanan. An intricate Ogoh-ogoh featuring various demons riding a chariot. An Ogoh-ogoh split down the middle with two halves. It reminded me of Two-Face from Batman. I think Ogoh-ogoh are really cool! Sadly, it turns out that Ogoh-ogoh have only been a thing in Bali since the 1980s, which I have mixed feelings about. Some 65-70% of Bali’s GDP comes from tourism, so it almost feels like they have created the phenomenon just to increase tourism revenue further. On the other hand, these sorts of traditions have to begin somehow, and a cynical part of me thinks that all festivals and celebrations around the world were created for financially-motivated reasons at some point in history, even if that was 1000 years ago. Either that, or they grew because of financially-motivated reasons, or continue to exist because of financially-motivated reasons, etc, etc. So I think it shouldn’t matter what the original founding of the festival or celebration was, nor if it was started 40 years ago or 400 years ago. Christmas was founded as a Christian celebration, and I still enjoy it every year despite ignoring the Christian origins, and knowing full well that the reason I still celebrate it is purely commercial. 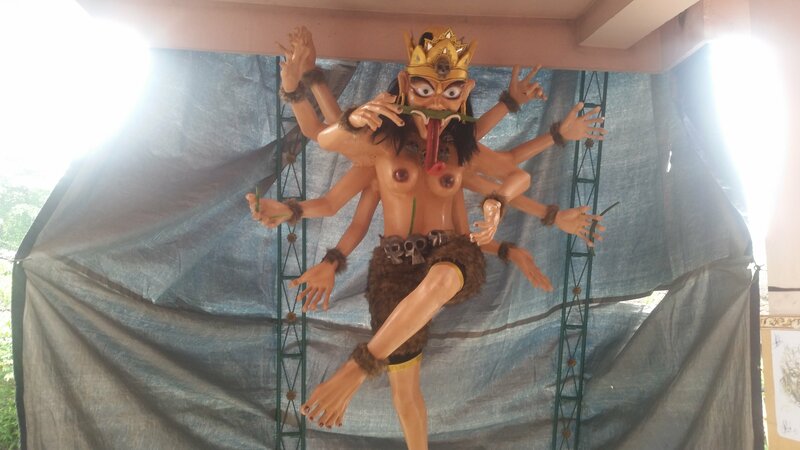 The Ogoh-Ogoh created by the villagers of Dalang. Having said all that, Ni’s tiny village, Dalang, which has a population of a few hundred, still created their own Ogoh-ogoh. 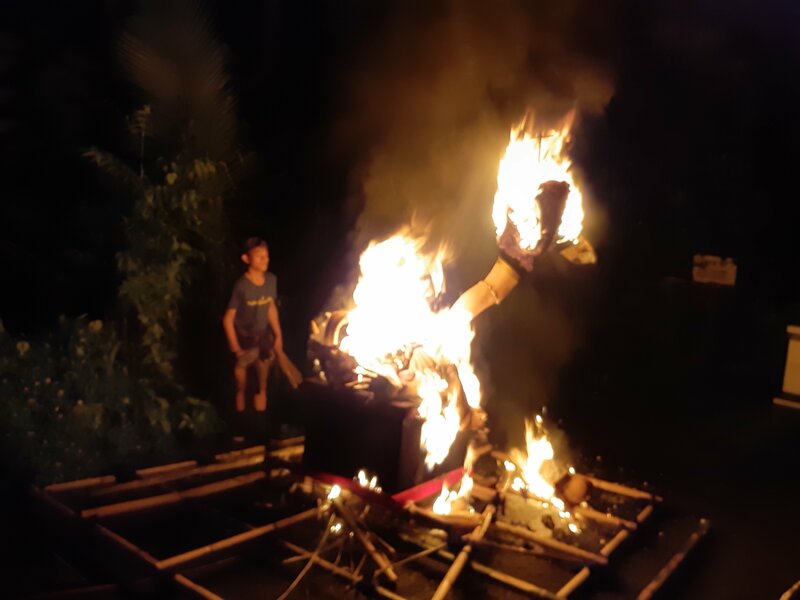 As far as I know (given that I witnessed the celebrations and was to some extent the talk of the village), I was the only foreigner to see it, so I doubt very much that the reason Dalang created their Ogoh-ogoh was for tourism money or other financial reasons. Perhaps in some places it has become financial (and Nyepi certainly has been commercialised - I saw so many signs in Canggu that sell the experience of ‘Nyepi through the eyes of a local’ - Ogoh-ogoh feature prominently), but it has also become a new tradition that every Balinese village now participates in. 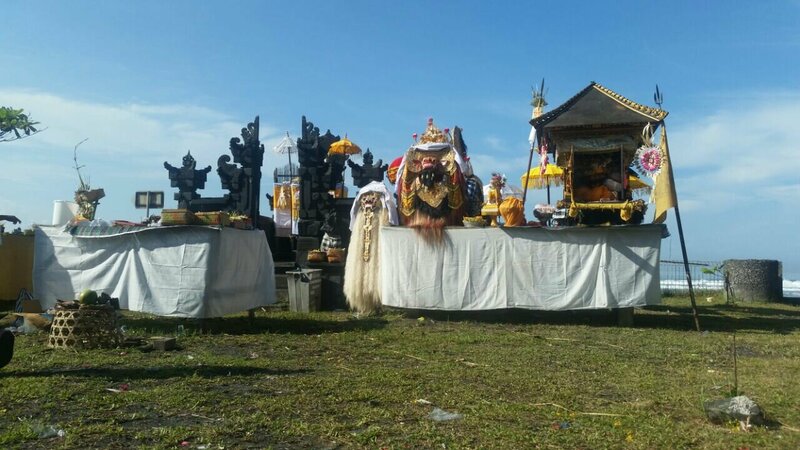 Dalang shows that regardless of why Bali started creating Ogoh-ogoh, it is now just another part of their culture. Ogoh-ogoh feature into the celebrations during Ngrupuk. Ni told me that the villagers would be parading it around the village. We had a nap so missed the start of the parade. 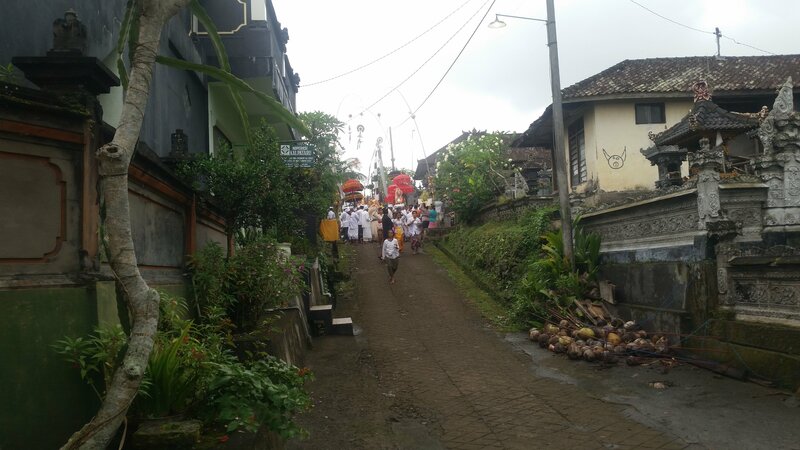 I could hear the Gamelan in the distance and was starting the get upset that we might miss it, but Ni then told me that the parade would be passing by her house soon as the village is only small. I was expecting to walk out of the house and see an Ogoh-ogoh, but was surprised to see the same spirit from Melasti again. It turns out that before they do anything with the Ogoh-ogoh, they do another parade with the spirit to bring happiness to the village too. As the parade with the spirit was wrapping up, it went down to the end of the (short) road and stopped, passing Dalang’s Ogoh-ogoh! The Ogoh-ogoh procession wasn’t ready to start moving yet, so we had a brief interlude. 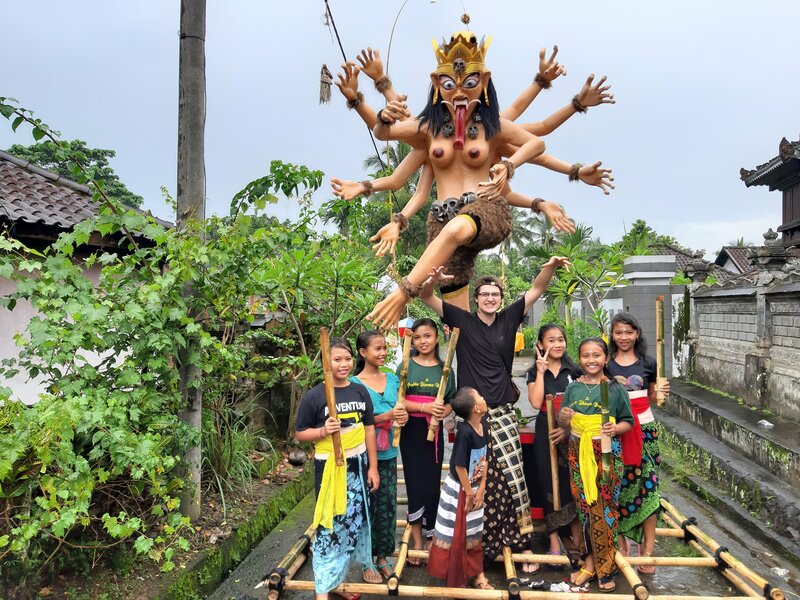 We took this opportunity to change out of traditional Balinese clothes - which had become wet from the rain - and also to mingle with the villagers. Making faces in the enclave where the Ogoh-Ogoh had been stored. We weren’t the only ones to get changed, and I found it interesting to see what the villagers would wear on a normal day. Most didn’t fully change out of their traditional clothes, so we had this interesting assortment of modern and traditional clothes - modern t-shirts with traditional sesaputan. Something I noticed was that many of the teenagers and young adults in Dalang have these green t-shirts that are stamped with a ‘MOD’ (Middle of Dalang) logo. Ni’s village is called ‘Middle of Dalang’ by the younger generation to differentiate it from the other Dalangs, which are different villages. I thought that this ‘village uniform’ was quite interesting. Ni has one too! The young men from Dalang, with their MOD t-shirt ‘uniform’. Oh, and Ni too. Whilst I interacted with the villagers, I kept catching a few young kids peeking at me from behind the legs of their parents or relatives. Every time I waved at them, they’d get shy and run away. I’d call after them ‘Om Swastiastu!’ (Hello!) or ‘Selamat Siang!’ (Good afternoon!). One of the boys was quite courageous and eager to show off, so he’d wave and reply ‘Hellooooo!’ in response. Meanwhile, there was a toddler who cried every time I looked at him. Hmmm. The younger generation of Dalang. I met a gaggle of teen girls who both wanted to meet me but were very shy to interact with me. After we’d ‘talked’ a while - them saying some small textbook phrases in English, myself saying even smaller phrases in broken Indonesian - they seemed more comfortable and even wanted to pose for a picture with me. The courageous boy I mentioned earlier decided to join in too at the last second! Posing with the teen girls. Because of tradition, everybody ‘has to help out’ whilst the Ogoh-ogoh is parading - this could mean carrying a torch, collecting offerings, playing music, or carrying something. A few people suggested that I should help carry the Ogoh-ogoh given that “I look strong”; I thought that was a bad idea as there would be a considerable height difference between myself and most of the villagers. Instead, it was decided that I would help by carrying one of two crates filled with bottled water. I was originally going to carry both crates, but I was told that not only would I have to carry it a long way, but that they would need access to the water during the procession, so it would be easier if I wasn’t excessively encumbered. I gave the second crate to a villager I had been talking to. Waiting to start the Ogoh-ogoh procession. Eventually, the procession set off from the bottom of the road. 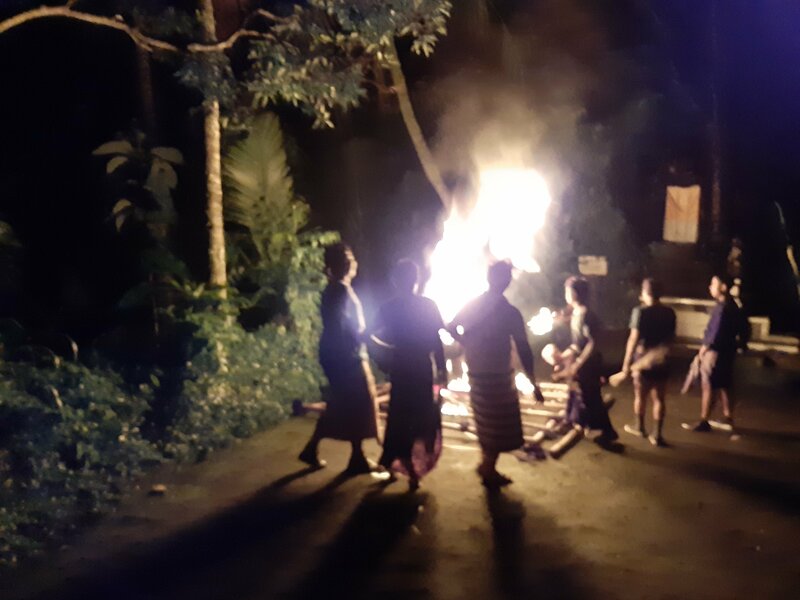 The teen girls that had taken a photo with me lead the procession, carrying torches made from bamboo sticks with a burning flammable substance in the top end. The older (but still young adult) women followed, carrying sculptures made from leaves and flowers - Ni was in this group. They were followed by the Ogoh-ogoh, carried by a dozen or so men. The rest of the villagers - including the band - and I were waiting in the small enclave where the Ogoh-ogoh had been built and stored. As the procession passed us by, we joined at the back. The kids were helping by carrying food or chiming the gongs, whilst a couple of women went to each road-side temple to collect the food that had been left as offerings. As we passed by the houses, the elders joined and walked with us, carrying incense, flicking holy waters, or ringing bells. There was a really great atmosphere. The rain was still drizzling a little, but everybody seemed really happy and I could tell that the day was important and special. I felt honoured to be welcomed into the group and to be able to participate with them. The Gamelan was loud and we were walking through a tropical landscape, following a demon sculpture - what’s not to love? The men seemed to enjoy shaking the Ogoh-ogoh this way and that, bringing it above their heads or dropping it all the way to their feet. It was built a lot less rigidly than I was expecting, so it shook and bent a lot. I found out later that it had a single flexible piece of rebar going through one leg and into the body, and the rest was made from painted polystyrene and resin - no wonder it isn’t rigid! After we had been walking for some time, the villagers carrying the Ogoh-ogoh called for ‘Aye-errr!’ (Air - the Indonesian word for Water). I came forward and offered up the water from my crate. I was surprised to see that the water I was carrying wasn’t in bottles, but was in those cup-shaped containers with a plastic film lid that you puncture with a straw - better for stacking, I guess! Some of the villagers drank the water, whilst others made many punctures in the cup and squeezed them so that the water sprayed everywhere, before throwing yet more of the water cups at the Ogoh-ogoh. I’m not sure why this was necessary, but it surprised me! Rice paddy that the procession passed. Eventually, we reached a small roundabout with a mini-temple in the middle. The girls at the front fell back to allow the Ogoh-ogoh to go around three times, shaking and rotating even more violently than before. They put the Ogoh-ogoh down, and then it was time for refreshments. The food that the villagers had left as offerings was now in a big box, and everyone rushed to take whatever they wanted. As one of the water-carrier, I distributed the water cups to whoever was thirsty. By the time I was done, there was only a small selection of things left in the food container. Oh well! I picked out a bunch of three small bananas (Ni’s father encouragingly told me that they were called Pisang in Indonesian), and was surprised to find big seeds in the banana. I’ve never had a banana with big inedible seeds before! I spat them out into a bush but ate the rest of the banana. The villagers then told me that we were waiting for another village - Dalang Desa - to arrive with their Ogoh-Ogoh. The roundabout and temple was at the top of a big field of rice paddies, and the view stretched down far below. It was beautiful. Whilst we waited, more and more villagers wanted to talk to me - even if it just meant translating through one of the other villagers who spoke English. I tried my best to speak Indonesian to them, but my grasp of the language was very limited. It felt a little bit like how I’d imagine a celebrity feels - everybody wants to talk to you! As somebody who can feel very drained by social situations, this wasn’t ideal, but I did my best to stay cordial and friendly. Eventually, we began to hear the sounds of Gamelan in the distance, which signalled the arrival of Dalang Desa. 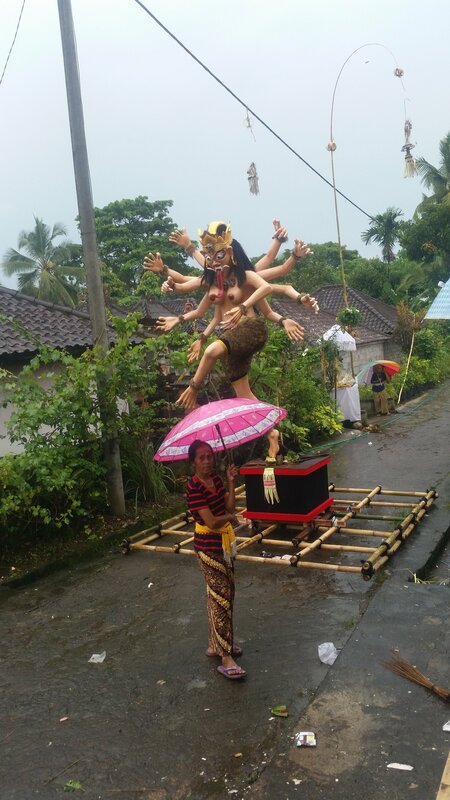 Like with Middle of Dalang, Dalang Desa’s Ogoh-ogoh spun around in front of the mini-temple three times. As the villages intermingled, the sun set and darkness settled upon Dalang. The girls re-lit their torches. They then proceeded to have a ‘Battle of the Bands’, taking turns for Dalang Desa to play Gamelan, then Middle of Dalang to play Gamelan. Both villages had a different assortment of instruments, so there was actually a very noticeable difference in the sound. 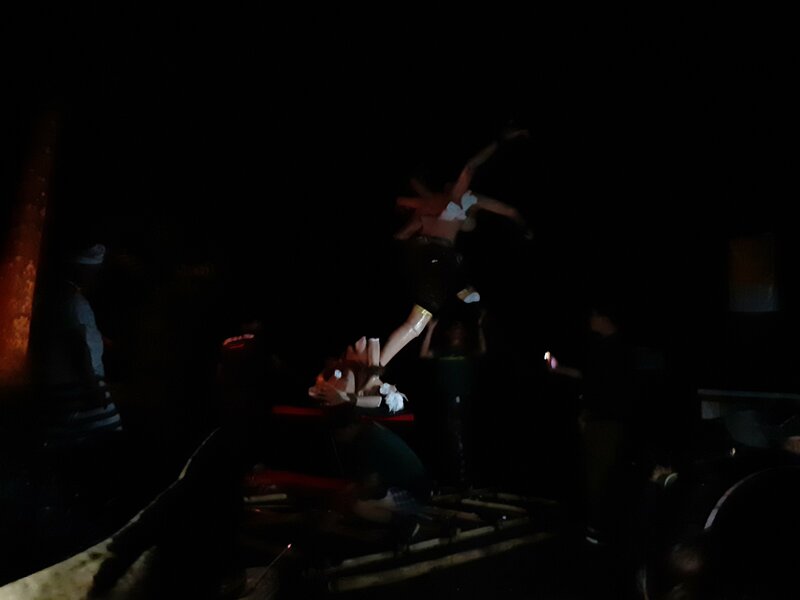 A few of the villagers from Dalang Desa were drunk, and they started dancing. Being the bule (foreigner), a few of them started dancing at me, trying to get me to dance back! I joined in and had fun until Ni grabbed me and told me to stop! After they finished playing, one of the girls from Middle of Dalang shrieked and began crying. There was a worried-sounding murmur among the villagers. I asked Ni what was going on, and she explained that we had stayed too long at the temple at the roundabout and that the girl had been possessed. Every temple - even the small ones - has a spirit guardian. Because Dalang Desa had been late, we had stayed too long at this temple and had offended the spirit. In revenge, it had possessed the girl! She told me this with complete seriousness, and all of the villagers looked serious and worried too. I had thought she had been bitten by a snake or something so I was relieved. The bands playing music. Yes, it’s dark! That’s the special thing about Bali and it’s spirituality and beliefs for me - they actually, truly believe in it and you can see it from their actions. It isn’t like other regions or religions where the population just go through the motions of their beliefs. As a counter example, some Christians (and I’m sure you can come up with counter-examples for other religions - Christianity is just the most familiar to me) constantly go on about how ‘if you do xyz you will go to hell’. Then when I do that thing, they treat it blasé and don’t do anything about it. Meanwhile if you do something dangerous in front of them they will panic for your safety and tell you off. I see a big incongruence here where they apparently believe I will burn for eternity but don’t mind too much, but panic when they think there is a chance I might die. Again, not picking on Christians, it’s just an incongruence I noticed in my life. 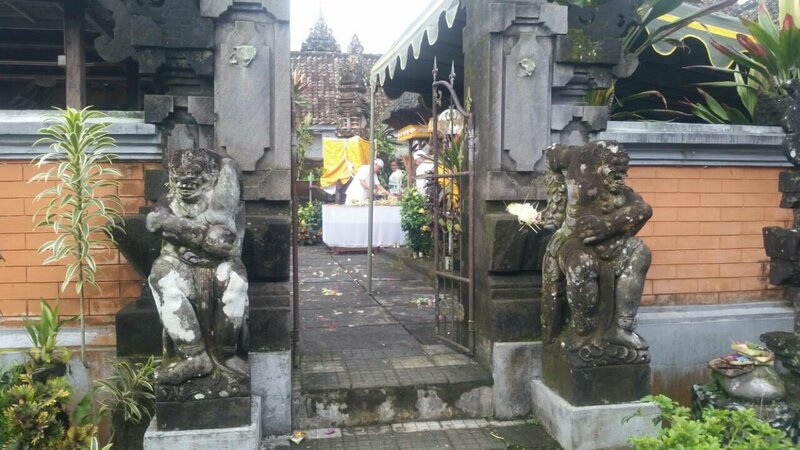 In Bali, the belief feels very powerful and deeply ingrained, and their actions show it. 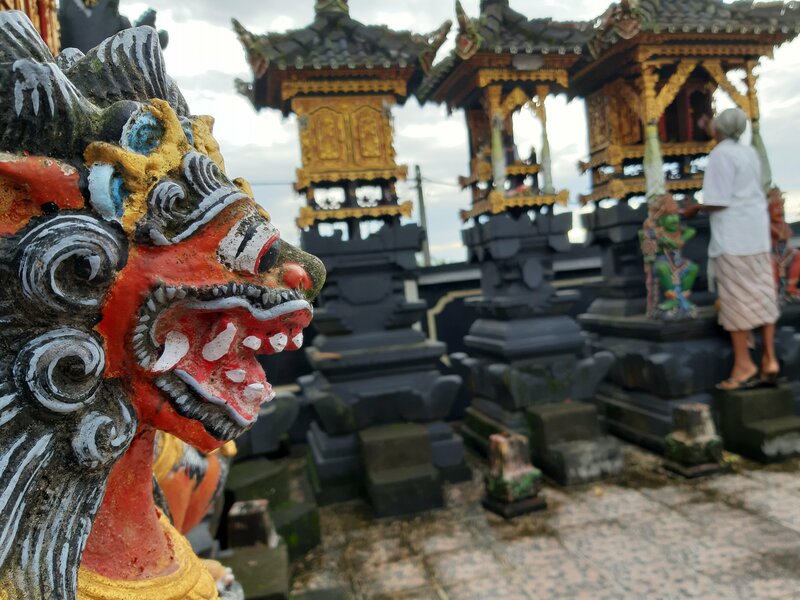 In Bali, Spirits and Demons exist and you have to worry about offending them. Black magic is something that you need to ward against so that it doesn’t affect the lives of yourself and your family. Possession is a real risk that you need to consider. Like the time when Ni had some money stolen and she insisted it was taken by an evil spirit called a Toyol. NO IT WASNT A SPIRIT IT WAS A PERSON SPEAK TO YOUR BOSS YOU HAVE CCTV! After the girl was possessed, everything stopped and we left quickly. It was pitch black now. Dalang is so rural that the only lights were from the distant towns; there are no street lights here. I stopped to take a photo, but sadly the camera wasn’t good enough to capture what I was seeing. Meanwhile the procession passed me by. I could just make out the possessed girl being carried by the other villagers some 50m ahead; she was sobbing and crying. 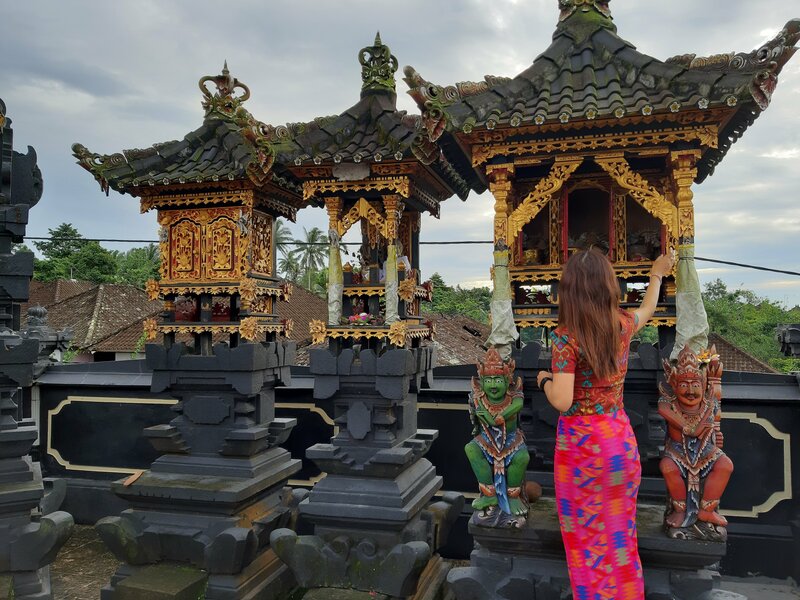 In the distance, I could hear the faint sounds of Gamelan; the higher tones of the music had dropped away so I could only hear the deeper booming sounds of the gongs. It felt sinister. The sounds of the crickets and other creatures were oppressive too. As the villagers moved away, I couldn’t see much of anything. I suddenly felt really alone. And a little scared. After a day of being immersed in mysticism, after partaking in a spiritual procession, when it’s so dark that you can’t 5 feet in front of you, when you’re away from the group and are vulnerable, when there’s a girl crying in the distance because she’s possessed, when there are burning torches in the distance (like in some kind of cult?! ), and when everyone has been telling you that we angered a spirit, it does weird things to your brain. You start believing in demons and spirits too, even when you really normally wouldn’t. You jump at the shadows and start hearing things. Perhaps even seeing things, too. Weird things run through your mind and you start thinking about life, death, and everything in between. I hurried to get back to the safety of the pack - with the rest of the villagers. The Ogoh-ogoh eventually reached the end of its journey. The villagers put it on the ground at the end of the road and gathered around it to pray. The girls who had been collecting the offerings distributed petals and leaves for people to pray with. The same process as before repeated; the villagers brought their palms above the head, drank and washed with holy water, and stuck rice to their heads and necks. The possessed girl cried off to one side. The final part of the ceremony involved destroying the Ogoh-ogoh. This seemed like a shame because it was an amazing work of craftsmanship. It is traditional for the Ogoh-ogoh to be destroyed and they believe that bad things could happen if they don’t. The men clambered around, ripping off the many arms one-by-one. They smashed the head, and left the Ogoh-ogoh as a disembodied pile of body parts. The Ogoh-ogoh, now just a pile of body parts. Most of the villagers left to go back to their homes; the celebration was over. A few of the men stayed; one had a spray bottle full of petrol, and he proceeded to spray the pile from several angles and directions. He took one of the burning bamboo torches, held it in front of him, and sprayed. A jet of flame burst forth and suddenly the whole Ogoh-ogoh was alight. A few of the other men had burning bamboo torches, and they threw that on the fire too. 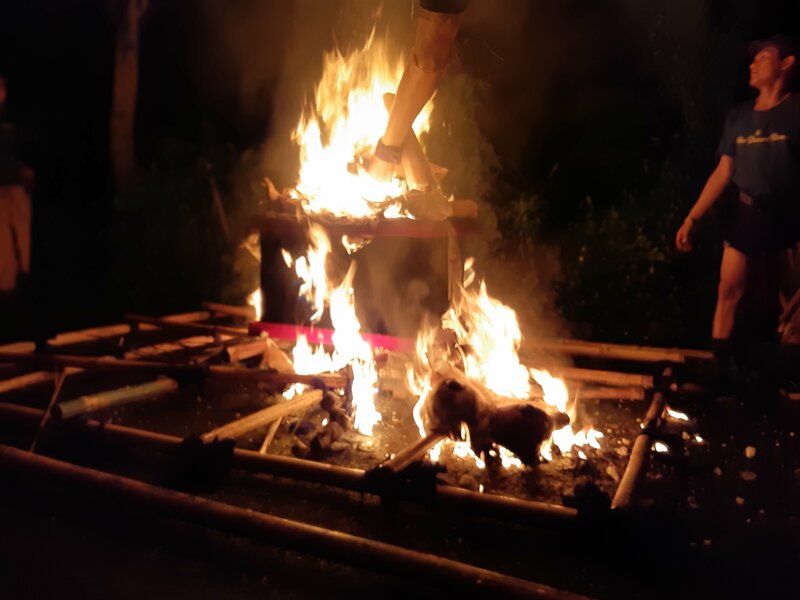 Watching the Ogoh-ogoh burn was a beautiful end to the night. I chatted with some of the guys who had stayed behind; a few spoke English, whilst others only knew a few obscenities, which they enjoyed shouting to see my reaction. One of the guys asked about the relationship between Ni and I, and if we were dating or not. Ni had seemed to want to keep this private from her villagers so far (because they would go on and on and on about marriage, allegedly), so I lied and simply replied “I wish!”. They then started asking me about my favourite football team - English football teams are of great interest to the Balinese - you see them wearing football jerseys everywhere. Manchester United, Chelsea, Liverpool, etc. You even see a few non-English famous football things like Munchen Bayern. Football isn’t really something I have ever followed, so I told them I support Liverpool FC - the team my grandfather had been fanatical about. They then went on to ask about my favourite goalkeeper. I definitely didn’t know the names of any goalkeepers, so I pretended I couldn’t understand what they was asking. They did all kinds of gestures to try to make me understand but I kept pretending I wasn’t getting it. In retrospect, I really regret doing that as I probably damaged their confidence in their English skills just to save face. I feel bad about it. I went back to Ni’s house shortly afterwards. We quickly ate and prepared to sleep. Dalang was really noisy that night. The pigs and roosters were surprisingly loud, and the dogs would bark occasionally. I was excited, my brain felt stimulated, and I had anticipation about Nyepi so I found it hard to get to sleep. I kept staring at the wall and the ceiling; there were a few geckos crawling around. I don’t know what I was expecting, but I didn’t feel any different the next morning. I checked my phone and saw that it was 5:45AM. Ni wakes up fairly early as she has to commute to work; I’d been spending so much time with her that I had started waking up early too. Today was Nyepi, so nobody would be working, but that doesn’t change my circadian rhythm. I also noticed I didn’t have any signal nor data connection; Nyepi officially starts at 6AM and then ends on 6AM the next day, but I guess Telkomsel (my data provider) stopped my service early. I didn’t have anything to do, and was still quite sleepy, so… I continued to rest. In the house at Middle of Dalang, you have to go through the bedrooms - including Ni’s room - to get to the bathroom. Yes, the layout is quite weird. Later that morning, Meme, Ni’s mother, turned on the light in Ni’s bedroom on her way to the bathroom, and just like that, the rules of Nyepi were already broken! It turns out that Meme doesn’t really care about the rules of Nyepi too much. Later in the day she went on to watch TV, and they had the lights on in their bedroom at night. So much for my expectations of what Nyepi would be like! I was a little disappointed; I was really curious to experience a day without entertainment and electricity. As much as I could, I went around turning off lights and sitting in the dark. Which just seems silly now that I read it, in retrospect. Tipat - raw rice is packed into a diamond shaped parcel made from banana leaf. It’s then steamed, causing it to form a solid block that resembles some kind of cheese (but still tastes like rice, just more solid and blocky). This was served both plain, alongside other dishes (as a substitute for rice), and as Tipat Cantok, which is it’s own dish that has a sauce. Nasi - plain white rice, steamed in a rice cooker. Much more clumpy than I’m used to, to the point that you really have to dig it out of the cooker with a spoon. I might even go so far as to say ‘overcooked’, but that’s just how they make it here. Tempe Goreng - This has quickly become one of my favourite foods. It’s made from hulled soya beans and the best way to describe it would be like a fried, savoury cake. You could consider it to be a similar food to Tofu, but honestly it has a much better texture and taste so I wouldn’t really compare them. During Nyepi, I had only had Qtela’s Tempe Cabai Rawit (crispy tempe from the Indonesian snack food company Qtela, covered with chilli spices.). Tempe Goreng tastes really different to Qtela’s Tempe, so I was really surprised when it tasted different to my expectations, and I initially didn’t like it! Bakso - Basically soft, smooth meatballs served in a thin broth. You’ll see signs offering ‘Bakso Ayam’ (Chicken Meatballs) all over Bali. These ones were vegetarian but I don’t know what they were made from - probably some kind of mushroom. And I didn’t particularly like it, either. Sate - in English we call this Satay. Basically strips of meat on skewers. I saw it all over Thailand and Kuala Lumpur, but I never tried it because I don’t eat meat. These ones were made from gluten as a textured vegetable protein. Quite firm, chewy, and tasty. Daun Singkong - Cassava Leaves! Cassava is cultivated all over Indonesia, and they use it extensively in many ways. They eat the tuber like we do a potato, they use it to make snack foods like crisps (chips in US), they cook the leaves into a spinach-like dish, they use it too feed animals, and they even use it for replacements for plastic. We ate the leaves, which were delicious and salty and were by far one of my favourite parts of the spread. Kacang - Salted, roasted peanuts! Yes, Indonesians (or just the Balinese?) eat peanuts as a side dish, not as a snack. ???? - No idea what this one is called. Thin, yellow, chewy strips which remind me of the meat you see in a Shwarma Kebab. Very tasty. Whenever I asked Meme what this one was called she just said to me “VEG-AY-TAAR-IAN” in a firm, almost threatening manner, so I decided not to press further. Supposedly made from gluten as well. ???? - Not sure about this one either. A sticky, stringy, curly, almost crispy, brown wafer. It reminded me of paneer in an Indian curry. Really hard to explain! Might be very thin wafers of fried tofu, I’m not sure. It mostly rained during Nyepi day, so we spent it indoors. Ni and I sat in the dark and chatted or napped, whilst Meme and Ni’s father watched TV. At one point, I worked out with my resistance bands and Ni’s father took an interest - he even tried using them too! The language barrier makes it hard for me to communicate with Ni’s family, but he speaks better English than the rest and we can talk about simple things. The rest of the family teach me Indonesian words and do their best with their limited English too, and every day I learn more Indonesian to talk with them too. Ni’s paternal grandparents live in the house in Dalang, so they were in the house for Nyepi too. Her grandfather seems very kind, and I really want to be able to talk with him. 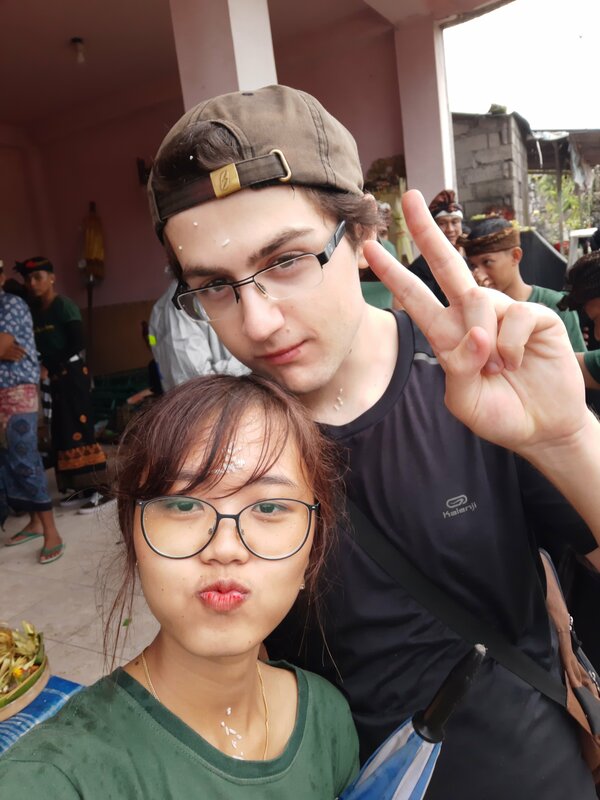 Apparently after Nyepi, someone from a different village asked him about me - the news had spread that a bule (foreigner) was staying in one of the local villages and they were incredibly curious. He replied that he was curious too, because he couldn’t talk with me!! Since I had found out about Nyepi, Ni had told me about how clear and bright the stars become with all of the lights turned off. Coming from places with huge light pollution, rural Bali already has very visible stars to me; I was excited to see the sky during Nyepi. 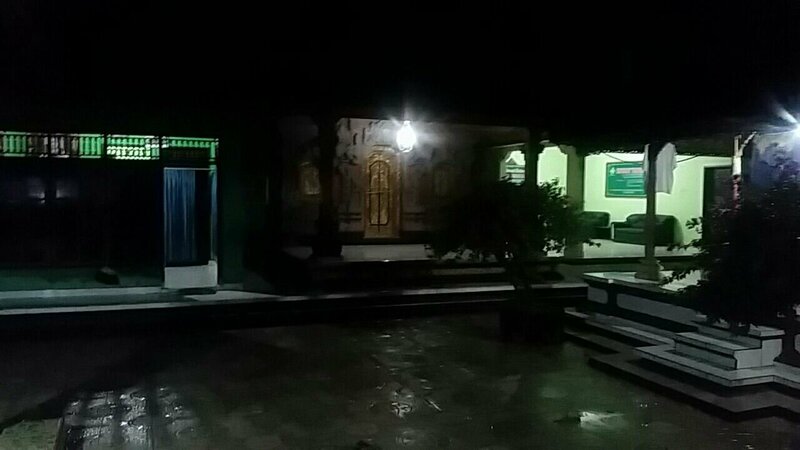 Dalang at night. Taken the night before Nyepi - I didn’t use my phone for Nyepi. I climbed up to the roof and looked out to the distance. Sadly, because of the rain it was too overcast for me to see much of anything. Ignoring the light produced by Meme, I counted a total of four lights across the whole 360° of the land that I could see. A small light quite close by in one of the neighbouring houses, and three in the distance. Even with the cloud cover, the moonlight was still illuminating. As I was stood there, I was struck with a sense of both peace and weirdness. I realised that for the first time in so long, I could only hear the natural sounds of animals; the pigs in the pen, the chickens, the crickets, and the tokay geckos. I couldn’t hear any human sounds; no mopeds, cars, music, nor talking. 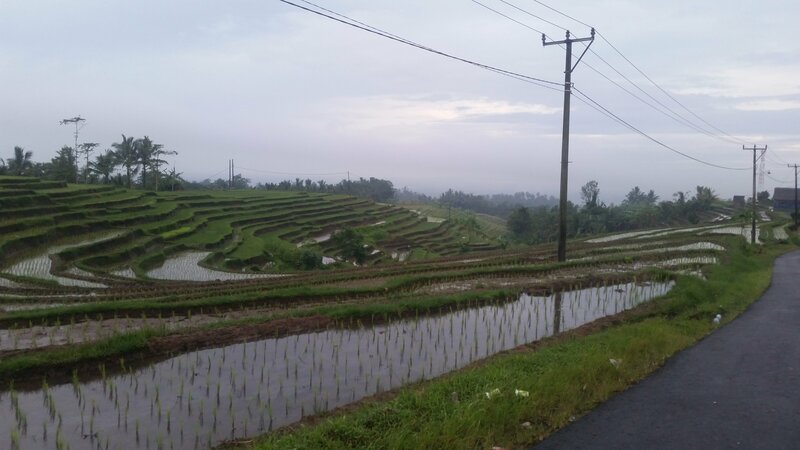 It made me think about what a Balinese village would have sounded like hundreds of years ago. The next morning, we had to head back to Tabanan early in the morning. 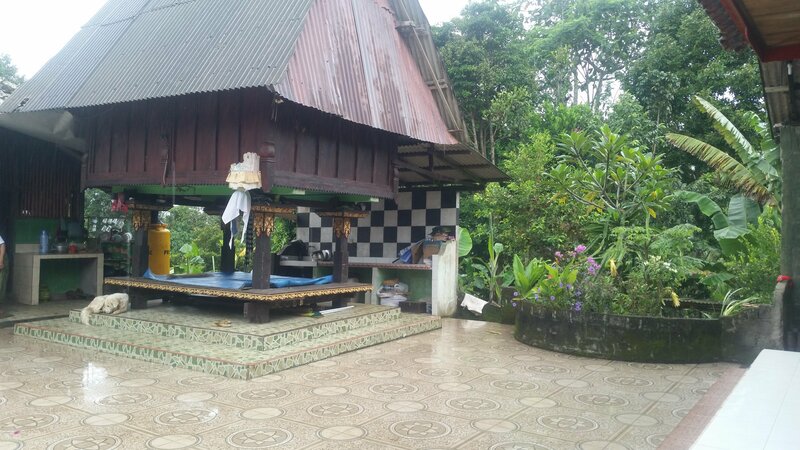 Ni and her grandfather prayed and gave thanks at the shrines on the roof of their Dalang house. I don’t have much to say about the day of Nyepi itself. Overall, I think the day was a bit of a disappointment. Things hadn’t panned out the way I had been expecting. Expectation is the mother of all disappointment, and all that. But the days before Nyepi more than made up for things - they were exciting and interesting, and I’m sure I’ll never forget them!